Any marketer knows that the power of Instagram is impressive and they know it’s important to learn How Instagram Drives an Explosive Sales Increase. 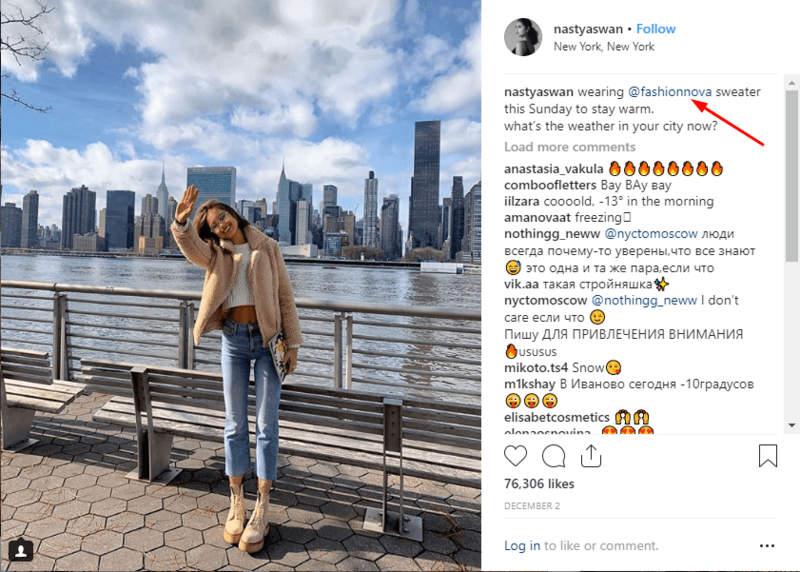 With more than One billion monthly users, Instagram has become one of the most popular marketing tools for businesses to promote their products and services. In fact, it is not only a large number of daily users who convince businesses to develop an Instagram account, but it is also the quality of people who use this social media platform. Instagrammers are keenly interested in the latest trends in their preferred industry. These people follow brands they trust. 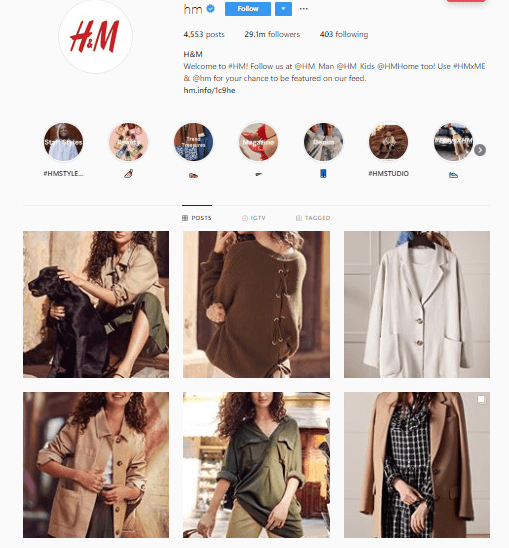 In fact, with the right photos and messages, Instagram can turn a passive follower into an active, repeat shopper. The key differentiation that Instagram offers is higher engagement than both Facebook and Twitter. How Do You Calculate or Measure your Engagement on Instagram? ((Likes Qty + Comments Qty) divided by Total Followers) multiplied by 100 = engagement rate in percentage. So now you have an understanding of Instagram’s astounding engagement statistics as compared to Facebook and Twitter. Monetize this knowledge; learn how you can use Instagram to increase your e-commerce sales. “before implementing any marketing strategy, a business owner should know very well who is his target audience. You should know what type of people are more likely to buy your products, what is their education level, or where they come from. Once you have identified their most important attributes, you can draft your marketing strategy to reach them”. The first impression always matters. If you want to win more followers, your Instagram profile should create a great first impression. When someone visits your Instagram profile, your visitors will first see your profile picture, recent posts, and read your biography. It must be immediately clear what product or service your business provides and how your products will help them. In addition, make your business recognizable by including your company’s logo or branding as your profile picture. The brand logo or favicon lets your visitors know that this is your official page. Your biography should look clean and include all the relevant details about your business including some #hashtags. The tone should be professional, clear, and concise. You can even include a link to your website in the bio to make it easier for your followers to access your e-shop and order your products. The link in your Bio should take the user to the current offer you are promoting. By taking care of all these points, your Instagram profile will grab your audience’s attention and drive more sales. Winning your followers’ attention is the first step in gaining traffic to your website. It should also make it easy for them to get your products with just a few clicks. You can use several methods to help your followers order your products faster and easier. For example, you can use Instagram stories to drive more sales. If your account has more than 10,000 followers, you can use the feature called “swipe up”. You can enable links within your Stories that navigate buyers to your website or offer where your products are displayed. Additionally, you can post your website’s link in your bio. Best practice is to link directly to the special offer identified in your post. When a potential customer accesses your Instagram account he will often read your bio to understand what you offer and learn more about your products. 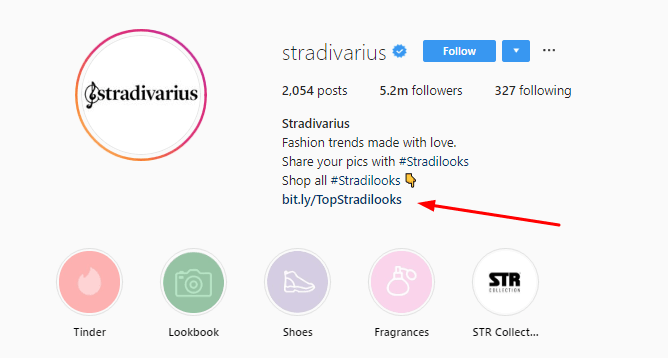 In the image above you see @stradivarius is using the Bitly link shortening service. Bitly also offers link tracking so you can track which posts generate the most traffic or conversions. There are a number of 3rd Party apps that allow you to create “Shoppable Posts”. This feature allows users to purchase products within the Instagram app. Later.com – provides a low cost app that adds links or tags a product in Instagram posts which turns the account feed into a clickable landing page. Curalate.com – claims to be the first solution to bring shopping to Instagram. Getsnapppt.com – Sell on Instagram – Free to use – free is good!! Finally, you can also add action buttons to your Instagram posts. Don’t forget to tag your products in various posts and add direct purchasing links in your posts. This may seem an obvious step, but you will be surprised to find how many businesses actually don’t use the best photos. If you want to drive more sales for your e-commerce business, you will need to create a rigorous posting calendar which contains stunning photos of your products. This means that you must allocate enough time to create and select the best photos of your products. Is is best practice try several combinations when you take photographs of your products. Marketers call this A/B testing to learn what combination or method works best. For example, you can use a plain background, or create lifestyle photos. Carefully analyze which combinations work best on your Instagram profile and stick to it. In addition, while your photos create curiosity, your caption should bring clarity to your offer. With this method each photo includes a fun caption, complete with the information required to convert a shopper to a buyer. The photo or video must communicate the features, functions and benefits your product and the caption includes a call to action like “click the link in our Bio to get this x“, and laser targeted relevant hashtags. Use your Instagram account to run contest, discount, or giveaway promotions. The basic premise when running a promotion is you offer a chance to win a prize in exchange for user actions. For example, you can ask them to share your post, take photos of themselves and post them on Instagram, tagging your brand, or they can invite other friends to like your Instagram page. This strategy creates a very important benefit. By participating in your contests, your followers will share your posts with their friends and families. Implementing this strategy will gain more followers and participants in your contests. Contests and giveaways will help boost engagement and get your content noticed by the Instagram algorithm. The benefit of using one of these three platforms to run your Instagram Contest is that they have developed a proven successful process. You do not need to “reinvent the wheel”. Instagram Contest Rules – Instagram provides Promotion Guidelines here. – A complete release of Instagram by each entrant or participant. – Acknowledgement that the promotion is in no way sponsored, endorsed or administered by, or associated with, Instagram. Social Shares – most contests reward users for social sharing with discount coupons, content downloads and product samples. Merchandise – some influencers offer valuable merchandise like a phone or designer handbag. Music Downloads – artists will offer free track downloads in exchange for social shares. Cash – some influencers will offer the chance to win a $1,000 prize in exchange for the user following the influencer’s following. You begin by configuring the “Competition Widget” that identifies the tasks you must complete like following, liking, commenting including visiting a blog article and commenting on the article. You can choose from 70 different “actions” that satisfy entry requirements. If you choose “Subscribe to Newsletter” you will sync with your email provider. You install or embed the “Competition Widget” to a Facebook tab or as an overlay button on your website. Gleam automatically flags fraudulent entries for you to review. Gleam even allows you to link your Competition to a Gallery to allow participants review and vote on their favorite submission – awesome! When you follow Instagrams Promotion Guidelines (Rules), offer a valuable prize and make it easy to participate using one of these awesome apps you will run a successful contest. Make sure you broadcast the contest winner through all your platforms. This final detail; to demonstrate that you have completed a legitimate contest, sets you up for a “win” on your next contest or giveaway. Influencers will help you promote your business to a fresher and larger audience. We believe that word of mouth can be dissected to understand exactly what makes it effective and that its impact can be measured using what we call “word-of-mouth equity”—an index of a brand’s power to generate messages that influence the consumer’s decision to purchase. To summarize, a partnership with an authentic influencer will not only drive more sales, but it will also increase your number of followers. On the other hand, when you choose an influencer, you should pay attention to the following criteria. First, the influencer should be relevant to your niche. This means that the influencer should have a history of posting content related to your business. The Influencer’s engagement level is where the value proposition is. Use the formula we provide earlier in this article to evaluate the influencers engagement percentage rate. You will have a successful collaboration when you partner with an influencer who has a high number of REAL authentic comments and likes related to your niche. In addition, you must check and verify that the influencer’s claims of success is real. For instance, ask for proof of results for past campaigns and ask for contact details of their past clients. Remember that implementing the above tactics in your marketing strategy is not complicated at all. 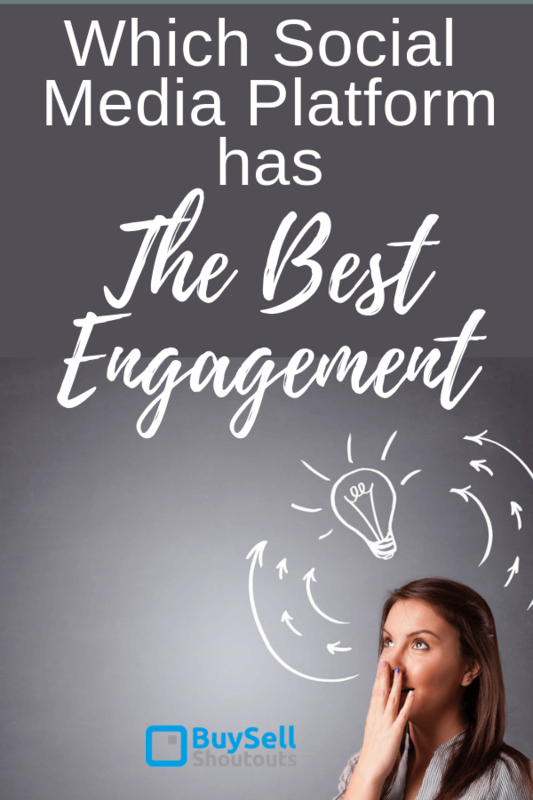 And finally, in addition to bringing more followers to your Instagram account, these strategies will help you boost your engagement and conversion rate. The result is they will inevitably bring more sales and help you take your e-commerce business to your next level. This is How Instagram Drives an Explosive Sales Increase!